At Honest Plumbing & Rooter, we know how horrible dealing unexpected septic tank backup is. Our experienced team has expertise needed to handle your septic system issues quickly, efficiently and at an affordable price. 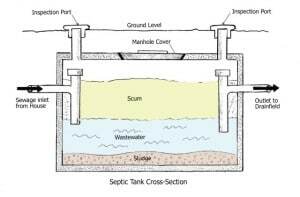 A septic tank holds solid waste until it’s pumped out or liquefied. A leach field, also called a leech drain, is a network of troughs with perforated pipes and buried holes surrounded by gravel. Along with the septic tank and associated piping, a leach field completes a modern septic system. The leach field is connected to the septic tank to eliminate toxins and impurities from the liquid that flows out of the septic tank and allows waste to be absorbed by the soil. It’s effective for disposal of organic materials which can be broken down by a microbial ecosystem. Most health departments require a percolation test to establish the suitability of leach field soils to receive septic tank effluent. Here at Honest Plumbing & Rooter we can troubleshoot for roots, cracks, rocks, build-up, and collapsed lines. Once the cause of the problem is determined we can clean, repair, or replace the affected lines. 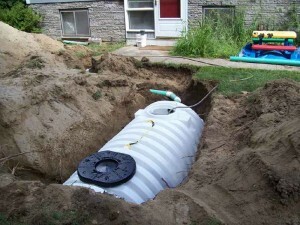 Most septic tanks are designed to last for up to 50 years. However, the lifespan of your tank may be shorter if it’s not properly maintained. The best way to avoid a septic tank emergency and promote efficiency is to have it pumped and cleaned regularly. The frequency that your septic tank needs to be pumped depends on the size of the tank, the number of people using it, the condition of the soil in the leach field, and the chemicals introduced into the system. preventing septic tanks from going over-capacity and inevitably causing a hazardous disaster. It is our goal to help you resolve any septic system or cesspool issues, satisfaction guaranteed! We have the expertise and equipment to inspect your system, then recommend and implement any necessary repairs or replacements. Whether it’s removing faulty piping or replacing your septic tank, you can be rest assured that Honest Plumbing & Rooter is qualified to handle any job to ensure that your septic system is safe, clean and fully operational. Call us today at (818) 840-8842 for a free estimate!